The art world is fascinating whatever way you look at it. Maybe it’s because of its alienness to me, but everything related to this world tends to astonish me. As a matter of fact, what happened last week at Sotheby’s strengthens my view of art as complex in essence and presence. When I heard about Banksy’s “deliberate destruction” of his own work, before the perplexed eyes first of those attending the auction and later of the whole world, I was shocked and appalled at what I considered the irreparable loss of something unique, original and irreplaceable. However, after watching the video a few times, I think anyone wanting to really “destroy” their work of art would have torn it to shreds or burnt it, making sure nothing at all remained. They would not have left the job “half-finished”. That’s why my initial astonishment at what seemed irretrievable has evolved into reflection on the value of this item; not so much on its artistic value as an ever-changing work –it does still exist, after all– but on its economic value, which has inevitably changed in a couple of seconds too. I am surprised at the velocity with which the video has gone viral and, most of all, at the widespread opinion that the author had planned this public “sacrifice” of his work to protest against the art market and the astronomical amounts of money spent in art by rich people, when the fact is that anyone who knew a tiny bit about the art market could have foreseen that the effect would be quite the opposite to the one supposedly intended by the author. Premeditated or not, whether Banksy has done this alone or with Sotheby’s, the past, present or future owners’ knowledge, no one can deny that his act has created a dramatic effect. Experts affirm that it has doubled the value of this work of art, which has been quickly renamed “Love is in the bin” and already visited by thousands of people at Sotheby’s New Bond Street gallery in London. As its new, proud owner has declared, she has “ended up with her own piece of art history”, and that’s always a solid asset. Fascinating, isn’t it? Do I hear more? 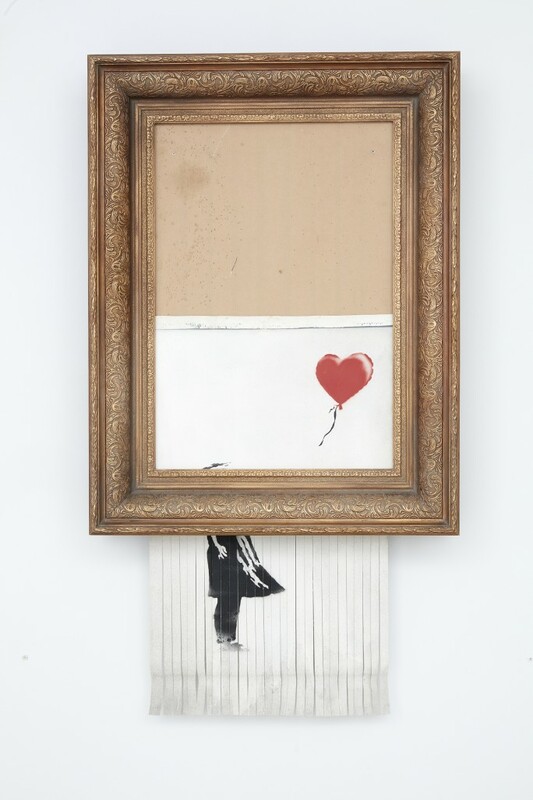 This entry was posted by mustblog in Art, auction, Editorial, Lifestyle and tagged Bansky, Love is in the bin, Sotheby´s. ← Belt bags, the new MUST?